Enermax, as the name suggests, is a company mainly remembered for their magnificent power supplies, though they have been attempting to branch out into other areas, such as cases and peripherals. 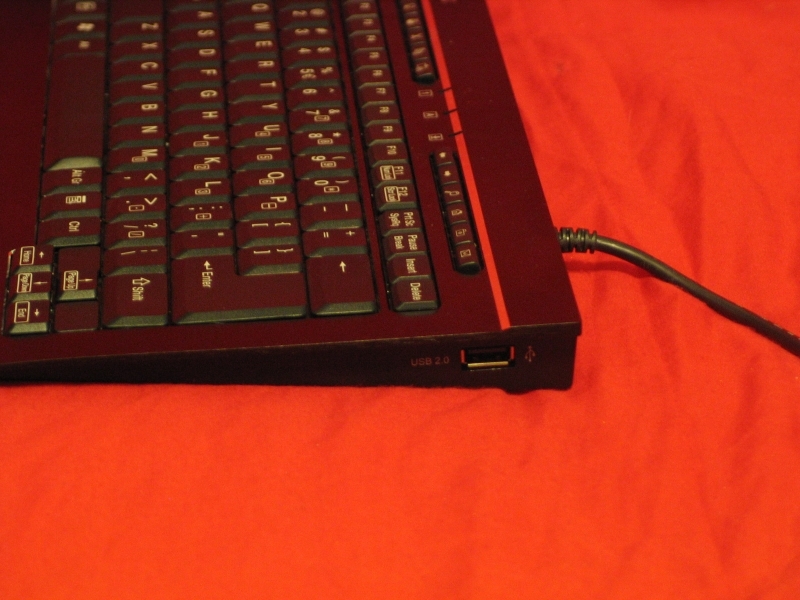 Enermax has put their time and and effort into designing a keyboard that is affordable for the every day person, yet good enough for the every day enthusiast. Today, we’ll be looking at just that. The Enermax Aurora Micro, an unusually sturdy compact keyboard. Let’s see if this is a mighty mite, or just shrimpy. The packaging is fairly minimal, with a profile shot of the keyboard front and center, and the keyboard itself peeking out to the left side, underneath a plastic shell. The back of the box goes into detail about all the features offered, in as many languages as they can cram on. 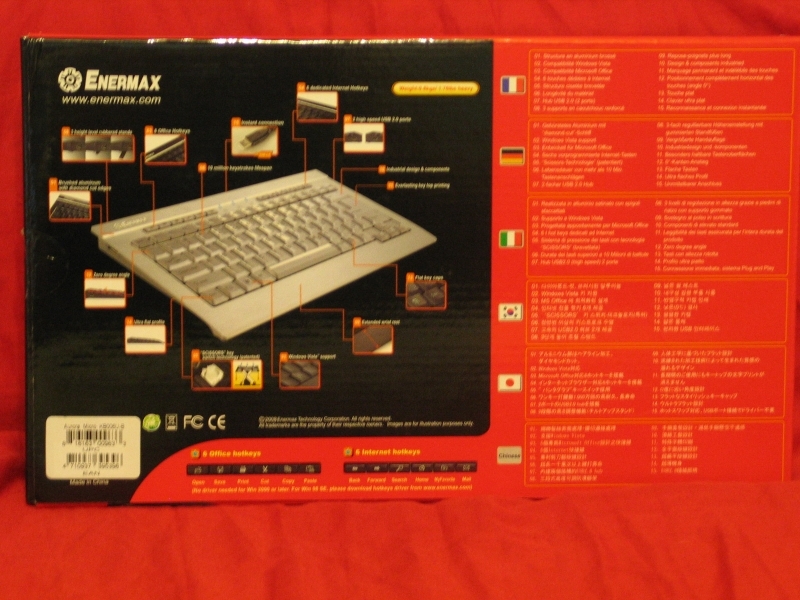 The keyboard itself is black anodized aluminum, with a silver accent strip along the top and silver Enermax logo in the upper left corner. 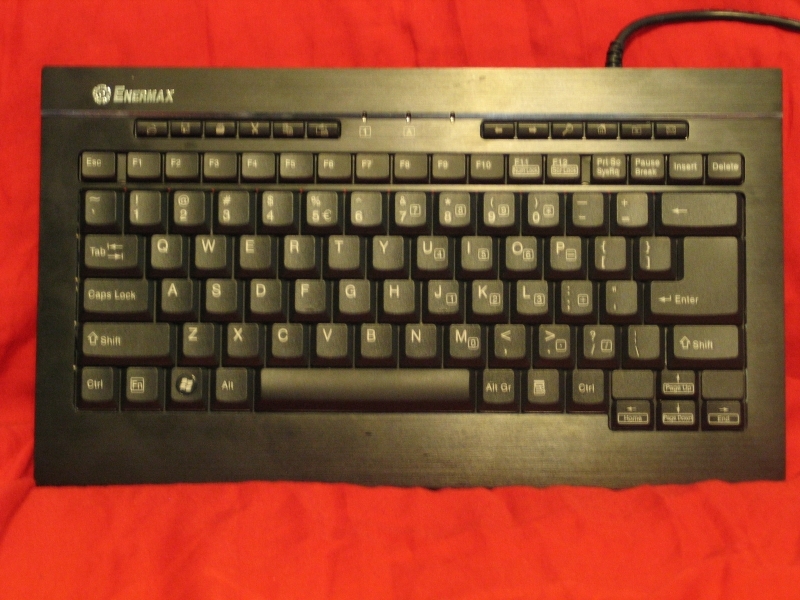 The keycaps are matte black plastic, with what Enermax claims to be “Everlasting key top printing”. The USB 2.0 ports on the Enermax Aurora Micro are split, with one on each side of the unit near the top. 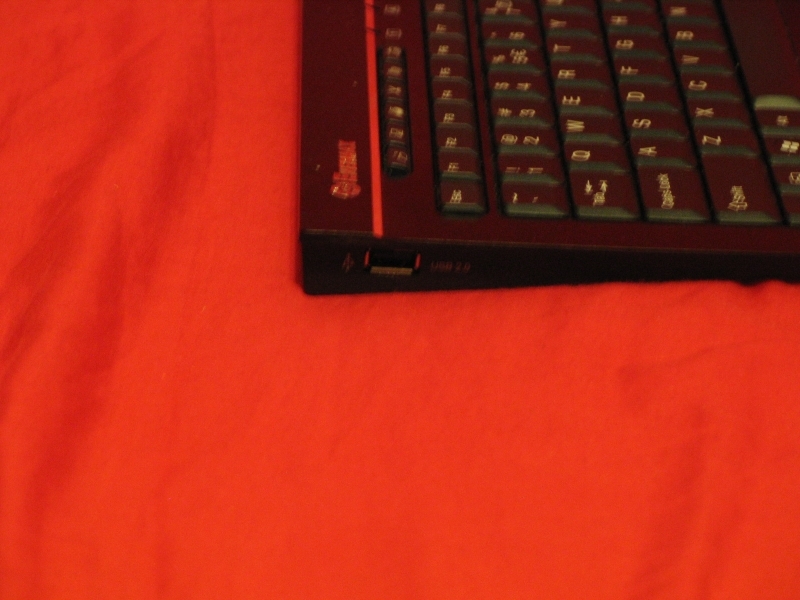 This makes plugging in large flash drives simpler, though a truly oversized flash drive may run into the lip on the top. 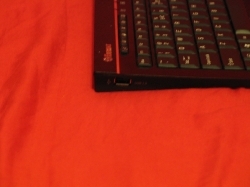 The bottom of the keyboard is flat, with three rubber feet along the bottom edge and two along the top to hold it still. If an upward tilt is desired, the two-stage feet can raise the back end up by about five degrees. 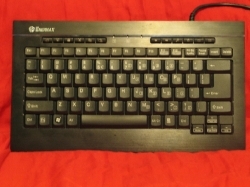 One thing that is immediately apparent with this keyboard is the feel: solid. The main enclosure is milled from a solid piece of aluminum, and the other parts have been fitted into it solidly, with no flex or looseness. Attempts to deliberately torque the frame, by twisting the ends between my hands, could not elicit so much as a creak. 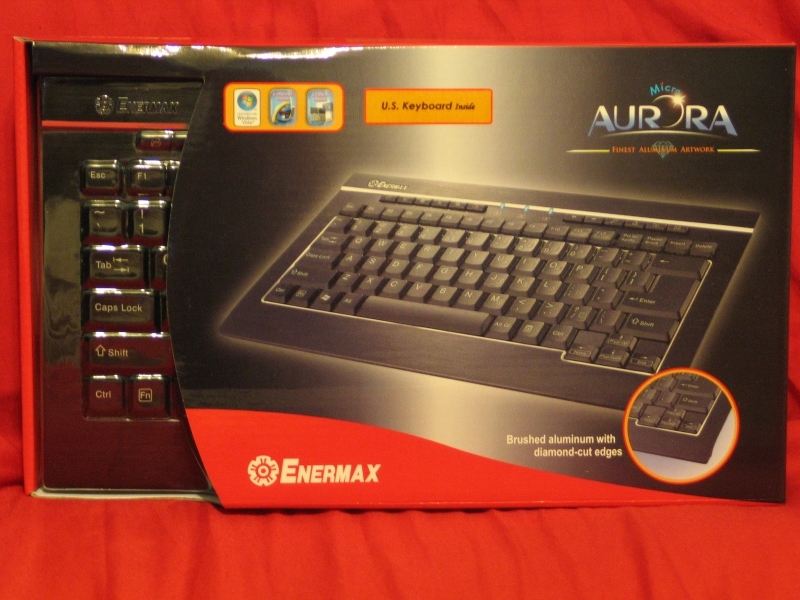 If you’re looking for a keyboard that can stand up to abuse, the Aurora Micro will certainly fit the bill. I’m new here, so I would like to say hi. Nice keyboard. 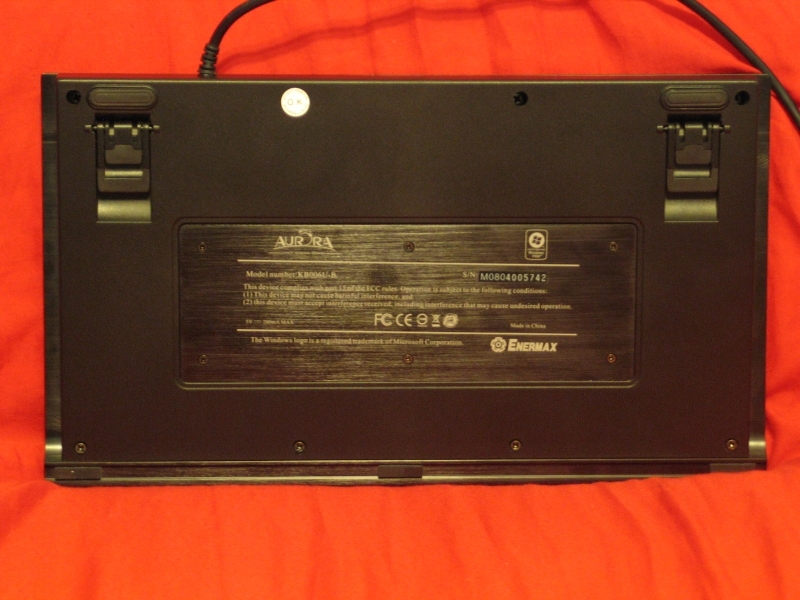 It looks ideal as a gaming portable keyboard. Aluminum is always awesome for anything.